Remove Chematix barcode before disposing of container. All containers shall have their labels defaced and shall be triple rinsed before disposal. Non-glass containers can go in regular trash. Containers with chemical residues must be disposed of through the regular hazardous waste stream. Glass disposal boxes consist of a sturdy cardboard box with a plastic liner that can be sealed when full. Glass disposal boxes must be stored in the laboratory when actively being used. Glass disposal boxes shall be removed from the laboratory either by trained lab personnel wearing at least hand and eye protection or custodial staff that have been properly trained. These boxes should not be emptied and reused. Always seal the liners and tape the box closed using heavy duty tape (e.g. duct tape). Use heavy duty gloves to place on a cart for transport if a lab member is removing the box. Then place inside the nearest dumpster outside the building. Never overfill glass disposal boxes. 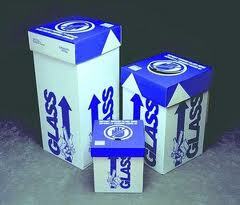 Overfilling glass boxes increases the risk of both puncture and strain injuries.